When politicians do not want to answer specific questions, they are taught to change the subject. Mike De Jong in particular wants the subjects to stay away, far away, from examinations of his personal job performance. It is amazing to me that he dares to run for leadership during a time that the Attorney General’s office is accused of obstructing justice in at least three high profile cases: Basi/Virk, Frank Paul and Paul Boyd. Additionally, de Jong has established roadblocks preventing efforts to improve police accountability. He may be a nice guy but he is thoroughly incompetent and unfit for leadership or any high office. We’ll see more ducking and evasion in the next weeks because Liberal leadership candidates prefer to talk about non-issues. Teen voting is one of those which is why the other candidates quickly jumped on board. any other problems plaguing British Columbia? Does he consider real issues? No, he proposes that 16 year olds be allowed the vote. What's in the box Mike? golf balls? Every one signed by a fellow Cabinet Minister. Note to readers. Be certain to add North Van's Grumps' BLOG BORG COLLECTIVE to your regular reading. It is one of the very good contributions to online journalism. You can find a link on the left margin of Northern Insights among the 'Blogs I Follow' or, better yet subscribe using the Atom Feed at the home page foot. Your IQ must be this high to ride errr make an “X” I mean. No? Okay you must be able to make an “X” to make an “X”. One of them will be giving out ponies next. I can't believe they've sunk this low. Expect the Marijuana Party to get some seats. 16 YEAR OLDS? Nope, they won't vote unless they can do so with their thumbs. Thumbs, good line but it might apply to anyone under 35. The prospect of older teens voting doesn't bother me. Older teens have long been considered good cannon fodder and some are more politically aware than adults I know. I remember the pride I took in my very first vote and ever since, except for some municipal ballots, I've never missed a vote in the last, um, 4 decades or so. I suspect though that allowing teens to vote earlier will cause them to become cynical about our political process even earlier. I wish de Jong had ideas on how to restore everyone's faith in democracy. He, who has been purposely blind to his own colleagues and has facilitated numerous cover-ups by his department, is the last person in BC to restore faith in democracy. Right on Norm! I am nearly incredulous at the audacity of deJong throwing his hat in the ring. His strong support in Abbotsford's South Asian community has perhaps emboldened him. This man is a disaster, but I have a hard time deciding on which candidate for the premiership is the biggest disaster – Christie, Kev, or Mike – I dunno. I suspect the only one worth considering might be George Abbot but I'm not sure of him either. I am starting to warm up to Christy Clark as the new Liberal leader. After all the beans are spilled on Ms. Clark and her close associates, the stake might finally sit within the heart of the Liberal Party so that it never rises again. I think you you nailed the problem, Norm – giving the vote to 16 year olds will see them become cynical about politics earlier they would now. The net result will be even fewer voters in future years. Those kids who voted at 16, 17, and 18, may well not vote again, for a long time. I am sure that is what I would have done. 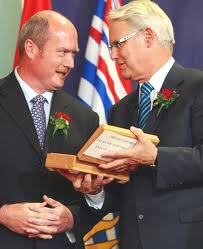 But, then I do not expect much from a professional politician like Mike de Jong. It would be much more appropriate to deal with real issues, and get everyone (of voting age) involved. But the voting age BIG DEAL is getting lots of coverage in the media, so de Jong is getting lots of free coverage. terrence, any of us following the real Basi/Virk story knows that the mainstream media would rather cover anything else. They've had the blinders on so long now they don't dare mention what is being talked about on the street. Global TV's lead tonight was the danger of Christmas decorations to toddlers. Second up was another cell phone antenna going up somewhere. That might have been a story 20 years ago but in 2010? Wasn't there a puppy needing adoption? Mike de Jong is a ding-dong. There you have … a 16 year old juvenile response. Just what he deserves,… what a nit-wit. And he wants to be leader! of what. the kindergarden. Gawd help us. Throw him out with the rest of fibbers. Young voters are naive and expect results from their vote. Go figure!